The mother, while out of doors, heard a buzzing sound, and striking with a stick at the object that made it, found it was a copper bird. Half of her stick was changed into copper. From this her boy made a copper bow and arrows, with which he shot a great many flickers, and they made blankets for each out of them. 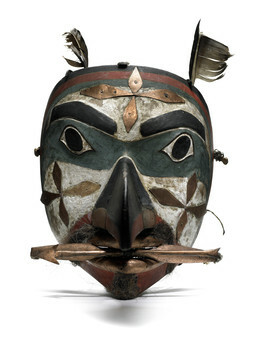 This mask of a bird with copper bow and arrows in its beak may represent a story from Haida tradition. The sky god, Shining Heavens, is raised by the daughter of a chief; when she makes him a bow and arrows from her copper bracelets, he shoots a wren, a cormorant, and a blue jay, putting on the skins to become different kinds of clouds in the sky. Copper ornaments on the mask may be stars.